Love rice? You're not alone. Rice is a daily staple for half the world's population and the average American eats 25 pounds of rice per year. But a 2012 study by Harvard researchers found that people who ate white rice more often had a greater risk of type 2 diabetes than those who ate less. Love rice? You're not alone. Rice is a daily staple for half the world's population and the average American eats 25 pounds of rice per year. But a 2012 study by Harvard researchers found that people who ate white rice more often had a greater risk of type 2 diabetes than those who ate it less often. And other research suggests that replacing white rice with brown rice, which is a whole-grain that has more fiber, can lower diabetes risk. There are a wide variety of rice types you can try. 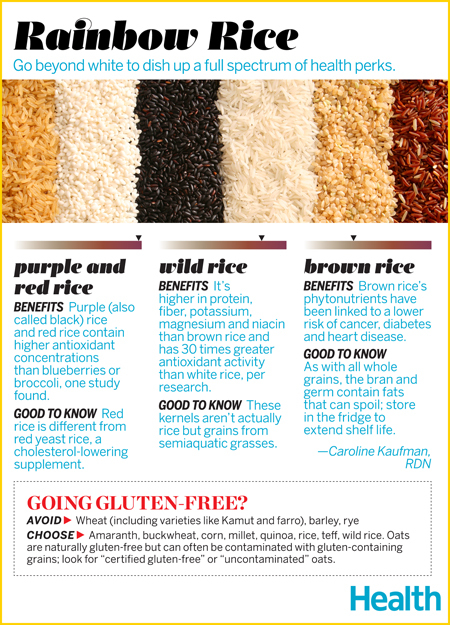 Here are the health benefits of three of them: Black rice, wild rice, and brown rice.